I’m not sure what the weather is like where you are, but here in Texas, we’ve officially begun that schizophrenic time in between summer and fall where the weather just can’t make up its mind. This is usually how it goes… the temperature drops to the 80’s and for a few fleeting days we remember what it’s like to not step outside and immediately start sweating. We rush to a patio, or the nearest Starbucks for a pumpkin latte, and bask in the glory because we all know what’s really going on… it’s just a tease. Summer isn’t over yet. I’m not sure how this goes in other parts, but without fail, each year, this is what we go through in Texas. The tease of fall. I’ll start thinking about new sweaters, lusting after boots, dreaming about pumpkin-and-spice-tasting everything… Only to come crashing back to reality days later when the temps go back up and I remember: We’ve got one more month to go (at least). So while my boots patiently wait in the closet, I’ve started celebrating fall with some of my favorites in the kitchen. Warming squash stews still don’t feel quite right, but for those of us stuck in the middle, we can take a little from this and a little from that. 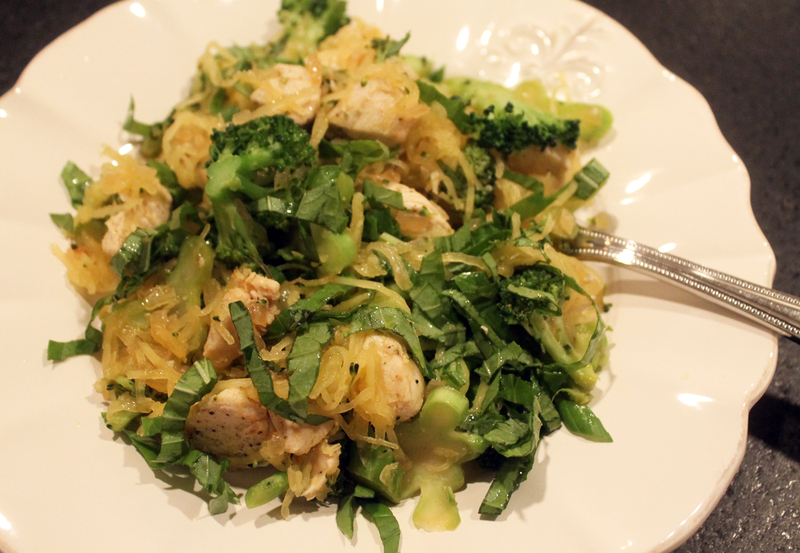 So I bring you the perfect combo of summer and fall with basil and spaghetti squash. 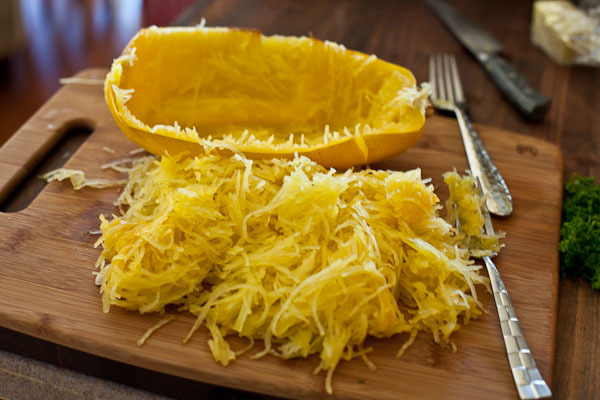 If vegetables can be cool, spaghetti squash is the coolest. I mean, just look at what comes out of that thing… To cook, I usually just put it in the oven on a baking sheet and bake at 350 for 30 minutes (more or less depending on the size). I take it out, let it cool and cut it in half long-ways. This is so much easier than trying to hack your way through a hard-as-a-rock, giant squash. You can thank me later. Then scoop out the seeds (roast them later for a healthy snack) and start scraping the insides with a fork. The meat shreds into thin spaghetti-like strings that you can twirl and spin just like the stuff your mom used to make. This vegetable is a godsend to anyone who’s eliminated actual spaghetti. And just as easy as boiling water too. Not to mention, the added nutritional benefits from being a vegetable rather than a refined starch. Just sayin. While the squash bakes, go ahead and start the sautee. 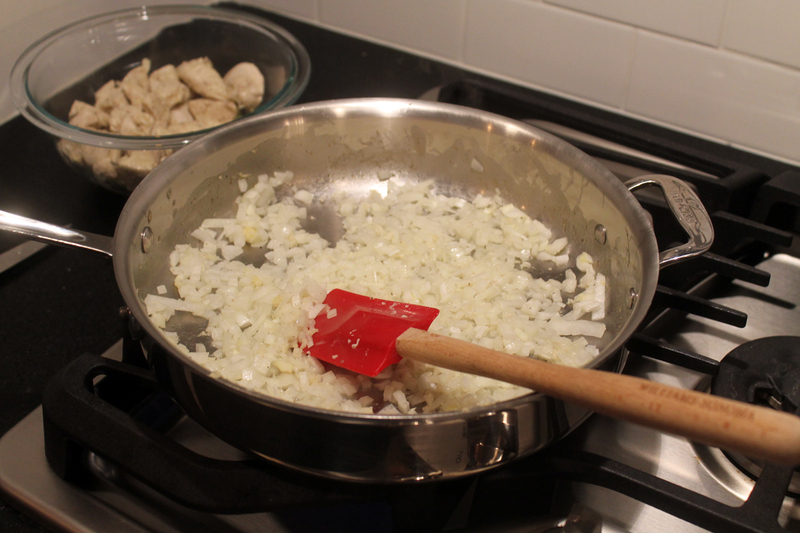 The onion and garlic add a lot of flavor at the start. Then at the end when you add the lemon, olive oil, and basil, it all comes together as a light sauce for the spaghetti. I try to prep everything ahead, but that doesn’t always happen… After the onions are in the pan, wash and chop the broccoli. 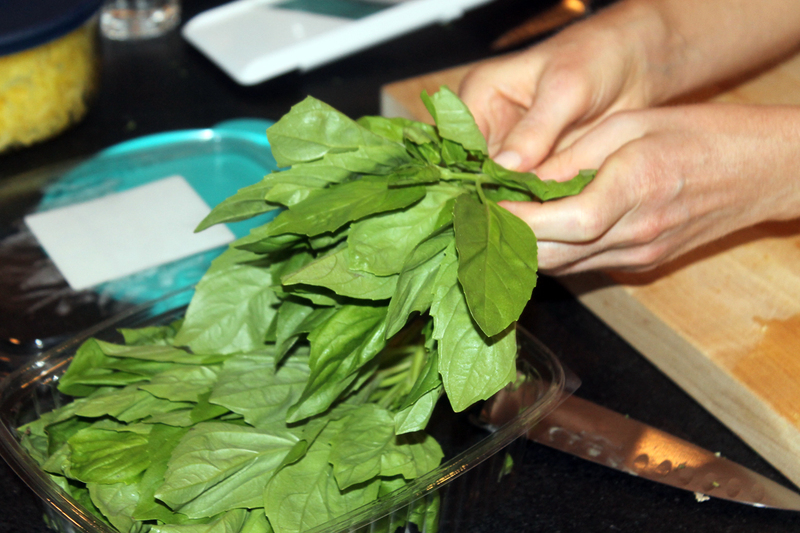 For the basil you can either tear it with your hands or thinly slice the leaves with a sharp knife so it’s ready to go when it’s time to eat. 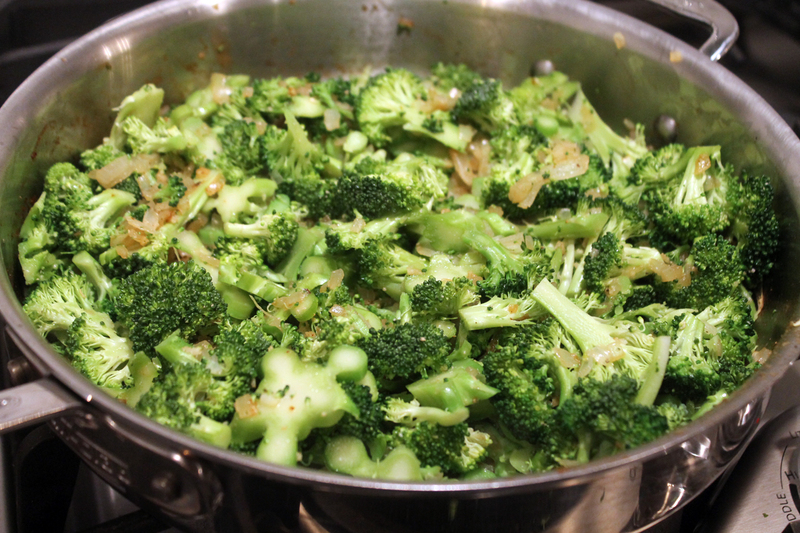 When the onions and garlic are slightly browned, add the broccoli. 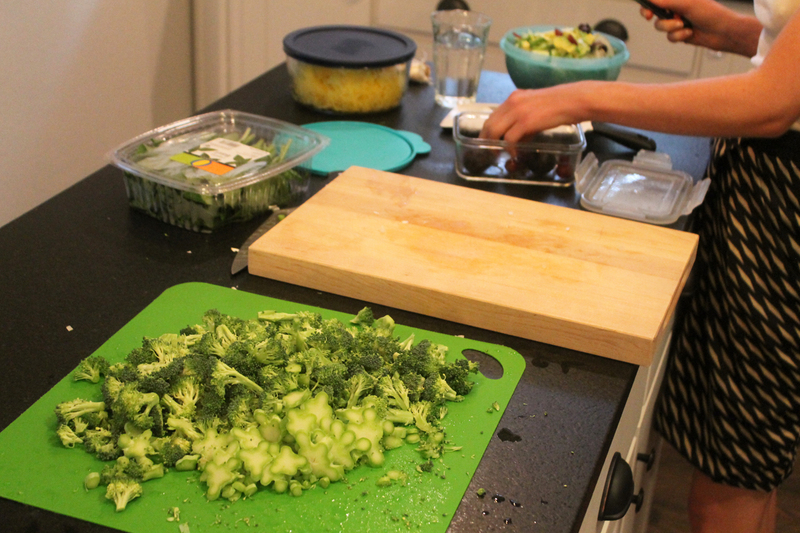 I love watching greens turn that bright, vibrant shade of green just a few minutes after they start cooking. 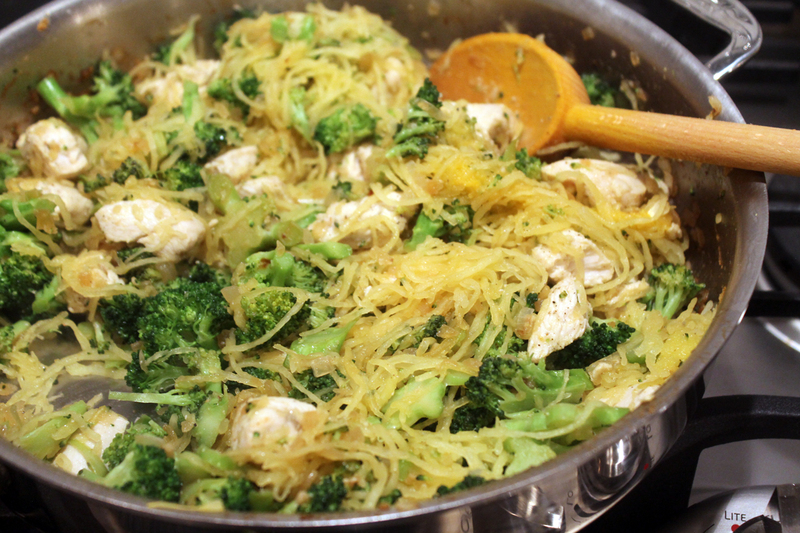 Once the broccoli is cooked through and a little tender, add the cooked chicken and spaghetti squash. Stir well so that it all gets mixed together. The last few steps are small, but so important. Squeeze half a lemon over the pasta and then season with salt and pepper. You can add the basil now, or if you plan to have leftovers, wait until you plate. Red pepper flakes are a good addition too if you want a little kick. Then twirl that spaghetti to your heart’s content and enjoy tasting summer and fall at the same time. First, get the spaghetti squash in the oven. Preheat oven to 350 and place squash on a baking sheet. Place in oven and bake about 30 minutes, more or less depending on the size. You’ll know it’s done when it’s softer to the touch and you can get a knife through it. While the squash is baking, prep your ingredients and start a large sautee pan over medium heat. Add olive oil, then onion and cook a few minutes until translucent, then add garlic and cook another minute. Add broccoli. Cook, stirring occasionally until broccoli softens, about 5-10 minutes. When the squash is done, allow to cool and then cut in half long-ways. Scoop out the goop and seeds in the middle and then, using a fork, shred the “meat” by gently scraping it away from the outer skin. Add spaghetti and cooked chicken to the broccoli mixture and stir to mix well. Squeeze half a lemon and season with salt and pepper to taste. To serve, drizzle with olive oil and top with fresh basil. For a little heat, add red pepper flakes. I love all that greenery there. Looks pretty delicious. The presentation is nice and I’m sure it’s really tasty. I am already craving from the looks of it. Gotta try this recipe at once.